As I wrap up for the year, I just wanted to quickly share our Christmas cards. 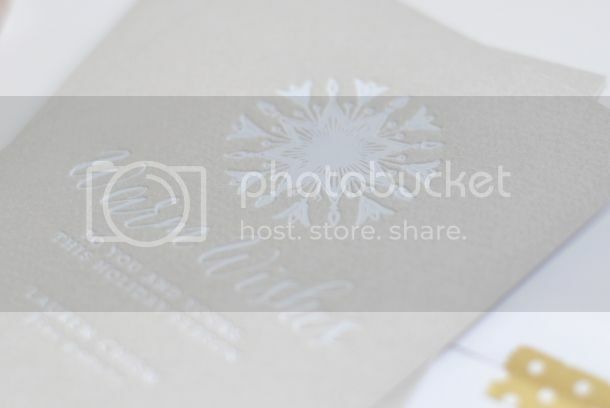 I just ordered my design from Minted and we went non-photo this year, with a few pictures of us and Marley on the back. 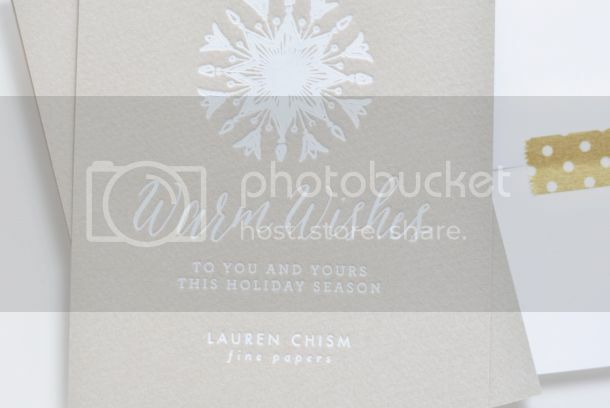 I love the simplicity of this design and especially the die-cut shape. It kind of makes it, don't you think? I hope your time with friends and family is magical. I can't help but daydream about our next Christmas with our little babe, but for this year, I am enjoying ALL the baby kicks and the extra special treatment you get when you're preggo. Wishing you a joy filled Merry Christmas and New Year! See you in 2016! Posted on December 24, 2015 by Lauren Chism and filed under Holiday. Before the holidays get too far from us (how is it already mid January?! 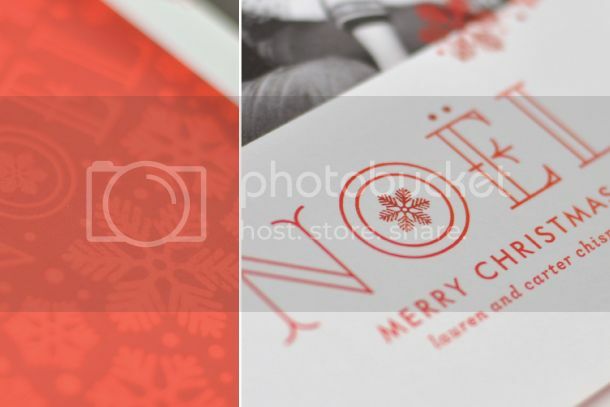 ), I wanted to share my business holiday cards that I sent out to friends, clients, and fellow wedding vendors. 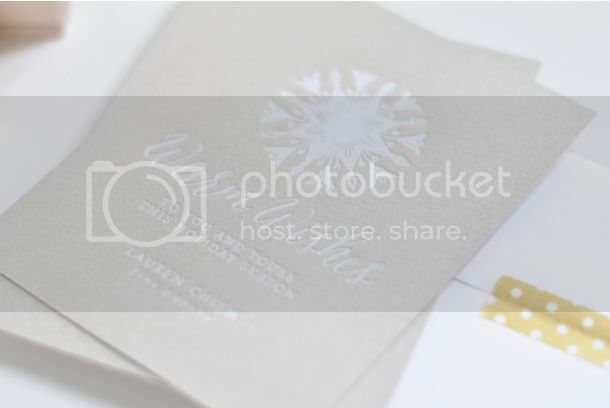 I like to use my own stationery as an opportunity to try some printing that I haven't done before, so I went with white foil on grey card stock. As I was stuffing them, I thought how pretty they would have been on navy stock and kind of wished I had tried that, but oh well - maybe next time! The white foil was even more beautiful than I excepted it to be. 'White ink' is a pretty elusive printing technique. If you see 'white' text on a flat printed card, it's really just the paper showing through with a colored background. Therefore, you can't print white on color envelopes easily. 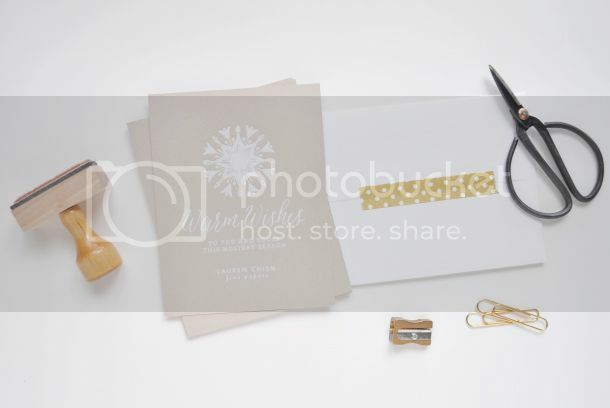 You can typically only print in white if you are doing offset, letterpress, foil and engraving, all of which range from fairly expensive to very expensive and offer varying looks. 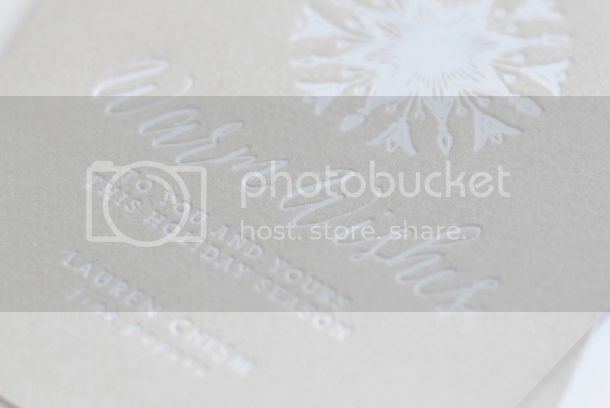 I personally think offset and letterpress don't give a saturated enough look for my taste and I am not a big fan of engraving, so when I got the foil, I was excited at how perfect it was. I think it would be beautiful on wedding invitations and am probably going to try to incorporate it into my wedding collection. 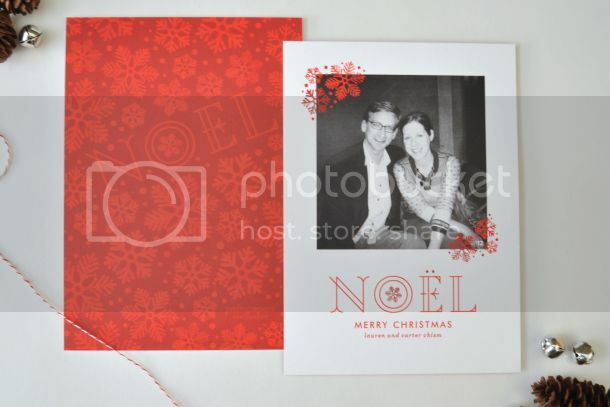 I also sent out personal photo holiday cards that I ordered through Minted. You can check those out on Instagram here. Posted on January 14, 2014 by Lauren Chism and filed under Holiday. The competition is intense - with a record 3, 348 entries! I will be attempting to vote for every. single. one. but just voting on some will help Minted know what they should sell this year so head on over to vote! 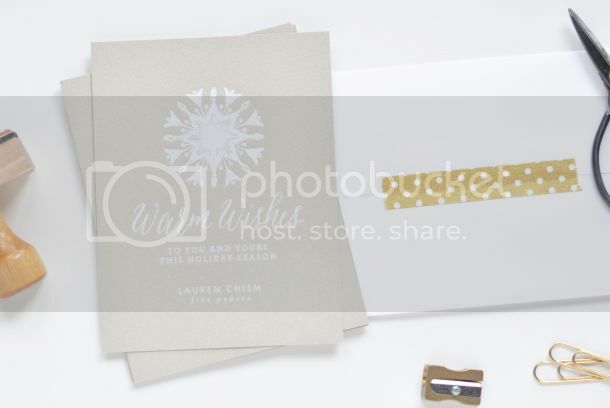 Posted on June 20, 2013 by Lauren Chism and filed under Holiday, Minted and tagged dallas design studio dallas invitations dallas letterpress holiday holiday cards holiday photo card holiday photo cards Minted. 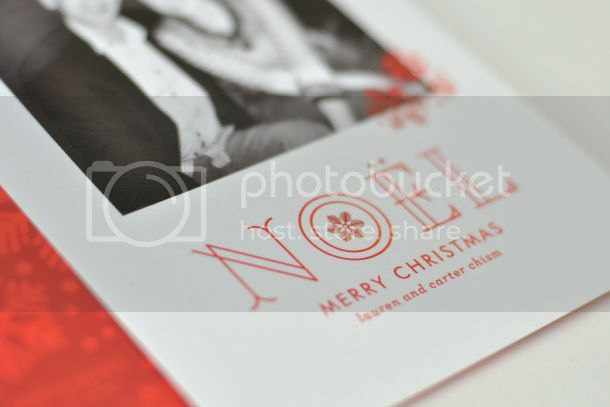 This year, I planned ahead and had ordered my business holiday cards by Thanksgiving. But my personal holiday cards where another story. 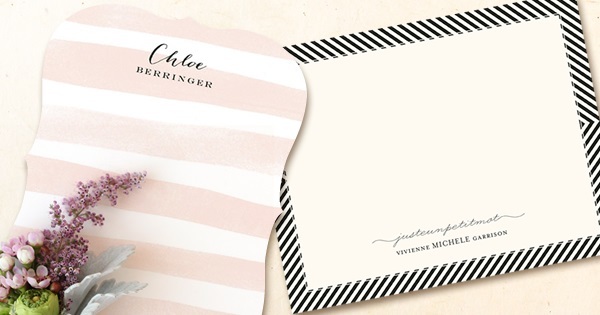 I always find it hard to design for myself, but without any professional or particularly amazing photos of my husband and I (turns out we wear sunglasses in pretty much all of our vacation photos), I tried not to stress and just decided to go with something pretty clean with a really bright, eye catching backer. This is just an instagram photo that someone took for us on or trip to San Francisco, but it's a favorite. 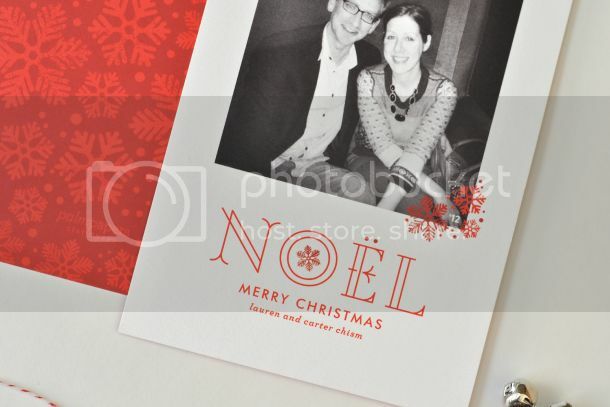 Posted on January 8, 2013 by Lauren and filed under Holiday and tagged holiday cards holiday photo cards.